Born in Tellichery, Kerala. He started to paint at the age of twelve. Lives and works in Chennai. 1971-76 Diploma in Fine Arts, Govt. College of Arts and Crafts, Madras. 1977-79 Kalayatra Exhb., Madras, Bombay and New Delhi. 1982 Solo exhb., Gallery am Horwath Haus, Murnau. 1983 Solo exhb., Bayerishes Verines Bank, Garmish. 1986 Solo exhb., European Patent Office Gallery, Munich. 1986 International Art from Munich Studio. 1991 9 Indian Contemporary Artists, Arne Geminde Museum, Amsterdam. 1991, 93 Exhb., Help Age India, Bombay. 1991 3 Indian Artists- European Patent Office Gallery, Munich. 1991 Touch Stone, Sakshi Gallery, Bombay. 1992 Solo exhb., Sakshi Gallery, Madras and Mumbai. 1992 7th Triennale, Lalit Kala Akademi, New Delhi. 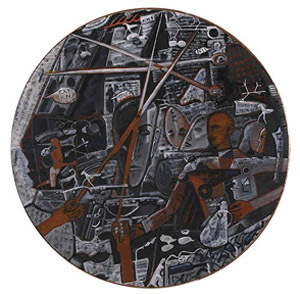 1992 Parallel Perceptions, Shridharani Gallery, New Delhi. 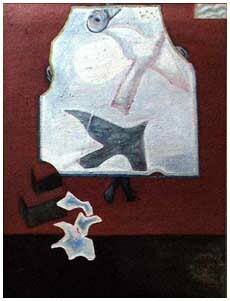 1993 Still Life, Sakshi Gallery, Bombay. 1994 Solo exhb., Schoo`s Art Gallery, Amsterdam. 1994 Reflections, Easel Gallery, Madras. 1994 100 Years of National Gallery of Modern Art, National Gallery of Modern Art, New Delhi. 1995 Water Colours: A Broader Spectrum, Gallery Chemould, Mumbai. Curt House Museum, Hertogen Bosh. Deutsche Bank, Mumbai and Bangalore. Ministry of External Affairs, Govt. of India, New Delhi. 1980, 90 Award, State Lalit Kala Akademi, Madras. 1990 Award, Bharat Bhavan, Bhopal. 1991-93, 1994-96 Received Cultural Fellowship, Govt. of India, New Delhi. Received National Award, Lalit Kala Akademi, New Delhi. 1994 Received Charles Wallace Grant.